The deployment of cloud-based solutions and services into the various enterprise markets has significantly enhanced business performance. Migration from traditional application solutions to NetSuite has proven to be particularly advantageous, by providing time and cost efficiency, flexibility, and higher productivity. Access to information from anywhere has been empowered by NetSuite’s unified business application suite, enabling management of multiple business operations through a single integrated solution. The prime focus of the NetSuite platform has been to accelerate the workflow of business operations and processes, coupled with increased clarity and control. Robust capabilities for data migration and rapid ERP deployment, alongside a strongPartner program for developers to extend NetSuite functionality, has benefitted many customers. With appropriate utilization of these solutions, enterprises can expect to increase their productivity, profit and clientele multi-fold. Analogous to other development platforms, the NetSuite ecosystem supports an extensive range of solution providers, making it a challenge for CIOs to choose the right providers for their specific needs. Helping to meet this challenge, CIOReview has proven to be a bright beacon in the NetSuite world. Our distinguished selection panel, comprising CEOs, CIOs, CTOs, industry analysts and the editorial board of CIOReview, has narrowed the choices to 20 providers that exhibit unrivaled competence in delivering leading-edge NetSuite solutions. 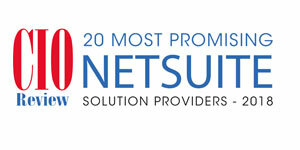 We present you CIOReview’s 20 Most Promising NetSuite Solution Providers - 2018.